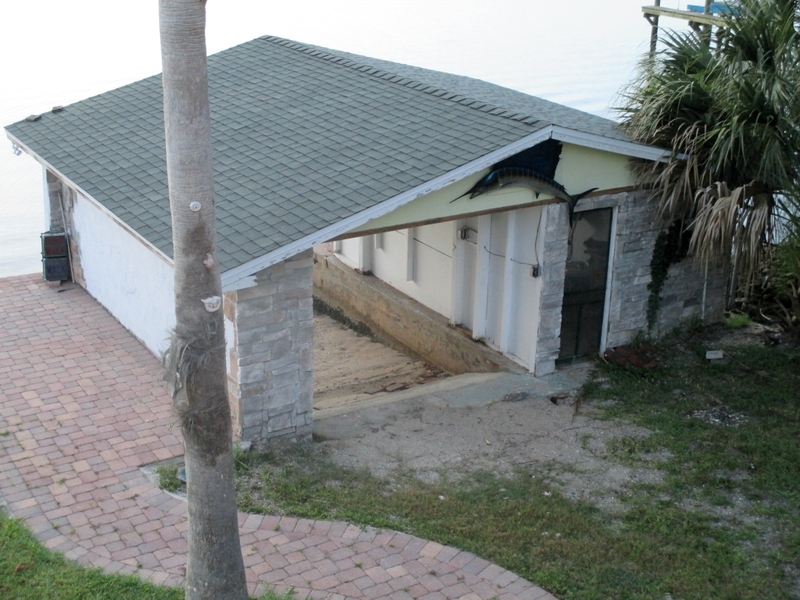 This posts continues my review of a horrible rental property I had a luck to choose when I visited Florida this summer. It wasn’t all bad. After all I woke up to this view from the deck outside my 2nd floor bedroom each morning, and we had really great weather all week. Hot and sunny – just what you’d expect on a Florida vacation in June. Sleeping at the Fisherman’s cottage was comfortable even though the air conditioning didn’t seem to get to the upstairs part of the house very well. Downstairs in the front room, and the connected bedroom, it was nice and cool. The beds were comfortable and the views were lovely. That is where my compliments of this place end. Lets talk about boating. 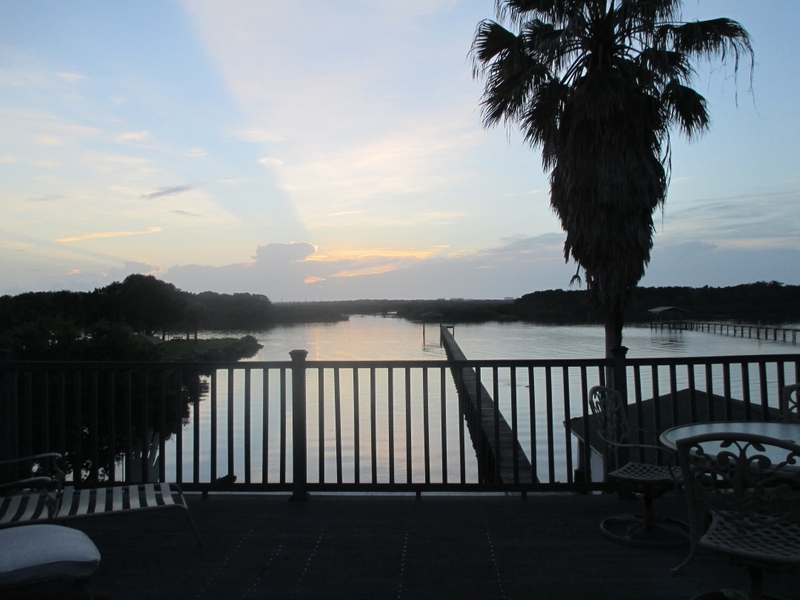 In the “Property Details” for this rental it reads: Perfect for boaters and fisherman, this house includes a long, private dock and boathouse plus a boat ramp to launch your boat directly into the Intracoastal. The boat house was a mess. The cement ramp was very steep and I honestly don’t know how you’d back a boat down into the water. There were blocks of cement in the water at the front of the opening and the water itself was very shallow. In fact we could walk all the way out to the end of the dock in the water no matter what the tide was. Obviously that is the reason for the long dock, but putting your boat in would be tricky at best. Also we couldn’t see any way to actually dock the boat out at the end of the dock. The water was always too low to do so and the one, rusty ladder was on the inner side – away from where your boat would be. Two kayaks come with the rental, but after looking inside this boat house (picture below) I was not about to go in and get them. It was also too hot for kayaking in my opinion, so I wouldn’t have used them anyway. Not only is this house rented out to vacationers, it is (was) on the market for sale! Would you rent a house, or show one for sale looking like this? I would not. 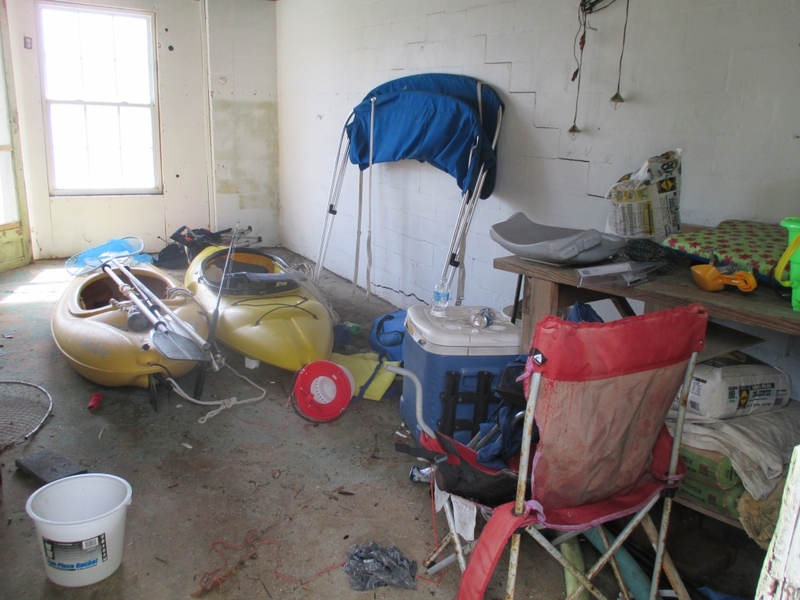 A nice mess inside the boat house.